Note: You can enter this giveaway one (1) time per e-mail address per day. Deadline is 11:59PM ET 8.8.15. Sustainable this, local that. Those words are all over the place these days, but what do they mean? Amy Franceschini and Daniel Tucker take a look at the farmers and activists living the buzzwords and pushing for change in America’s food production and safety standards. 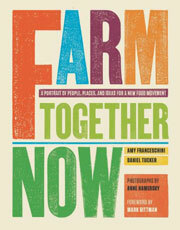 The authors visit 20 farms scattered across the country in an effort to understand how modern-day agrarians from the Pacific Coast to the Eastern seaboard are working to impact what ends up on your plate. We might be known for our insatiable sweet tooth around here (David’s Ultimate Chocolate Chip Cookies, for example), but we know our way around the farm, too. Or the farm stand, at least. With the help of our fearless Greenmarket Girl, there’s no sunchoke or pea shoot we can’t handle. To make sure you’re kept abreast of our latest giveaways, subscribe to our new giveaway-only feed. If you want stay on top of our recipes and writings, subscribe to our general feeds, e-mails, or digest in the column to the right. Visit our FAQs page, if you have questions. NO PURCHASE NECESSARY TO ENTER OR WIN. Void where prohibited by law. Open to legal residents of the 50 U.S., D.C. and Canada (excluding Quebec) who are at least eighteen years old at the time of entry and have internet access. Begins on 7.18.15 at 12:01 a.m. ET and ends on 8.8.15 at 11:59 p.m. ET. To enter this giveaway, submit your full name and email address on this form. Odds of winning this giveaway depend on the total number of eligible entries received. Only one (1) entry per email address per day. Sponsored by Leite’s Culinaria, Inc. For more information, visit our Official Rules. Be sure to add giveaways@leitesculinaria.com to ensure notification if you are the winner.